Preheat oven to 225° F and spray a cookie sheet with nonstick cooking spray. Heat the sugar, syrup and margarine in a medium saucepan over medium heat until boiling, stirring occasionally. Boil for 3 minutes (do not stir). Remove from heat and stir in soda and Lemon-Lime Kool Aid. Pour over 6 cups Chex™ Cereal and stir gently. Spread onto greased cookie sheet. Bake at 225° F for 30 minutes. Remove from oven and while still warm, set 20-30 pieces on another greased cookie sheet to use as your Frankenstein's. Cool completely, stirring occasionally if desired. To assemble Frankensteins, melt chocolate candy coating in a small microwave-safe bowl for 45 seconds. Stir well. Dip one end of a Chex™ square into the chocolate. This is your hair. Set on wax paper to dry. Using a toothpick, dip end into chocolate and draw two eyes and a mouth on your creature. Repeat with all 20-30 squares. Melt vanilla candy coating as above. Dip two Cheerios™ in coating and attach to sides of Frankenstein (these are his bolts). Let dry completely. Mix remaining Chex™ and other Mix-ins in a large bowl. Top with your Frankensteins and serve it up to the waiting Goblins and Ghouls! If you need a frightfully yummy snack for your Halloween get-together or class party, Franken-Snacks are a great way to feed a crowd! You can change up the "Mix-in" ingredients to suit your family's taste (or whatever you need to clean out the pantry! 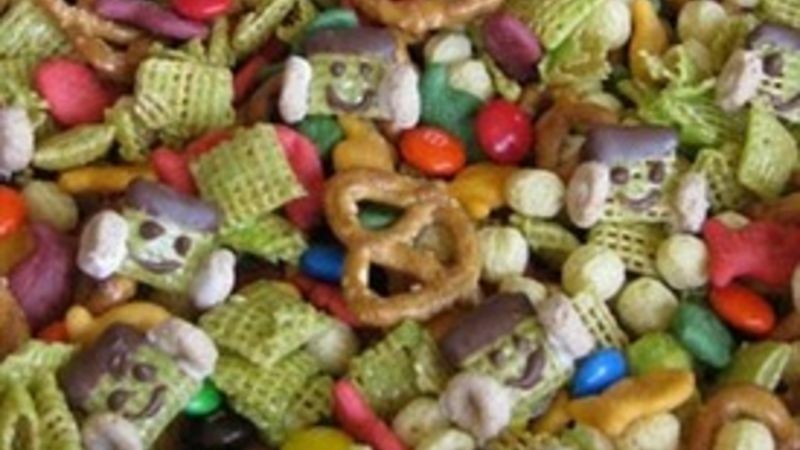 :)), the Chex Frankensteins are what makes this treat truly "Spook-tacular." My kids love helping make these, just make sure to supervise when boiling the sugar mixture and baking the candy-coated Chex. Does this look like a spooky brew in a cauldron or what?! Follow the recipe directions to make the candy-coated Chex. Remove from oven and while still warm; set 20-30 pieces on another greased cookie sheet to use as your "Frankensteins". To assemble "Frankensteins," melt chocolate candy coating in a small microwave-safe bowl for 45 seconds. Stir well. Dip one end of a Chex square into the chocolate. This is your "hair." Set on wax paper to dry. Using a toothpick, dip end into chocolate and draw two eyes and a mouth on your creature. Repeat with all 20-30 squares. When set (about 5 minutes), melt vanilla candy coating as above. Dip two Cheerios in coating and attach to sides of Frankenstein (these are his "bolts"). Let dry completely. Mix remaining Chex and other mix-ins in a large bowl. Top with your "Frankensteins" and serve it up to the waiting goblins and ghouls! You can also spoon into small bags and tie with ribbon for a fun school snack or party favor. Happy Haunting!